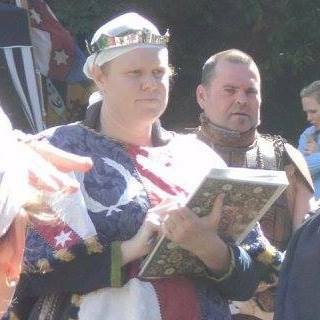 Two weeks before Lochac’s November Crown Tournament AS50 (2015) event in the Shire of Dismal Fogs (Katoomba, near Sydney Australia), I was asked to take on the role of Herald in Charge at the event. I’ve never needed my own book of ceremonies before; however, I had a need to make one for this event. For the most part, I obtained copies of ceremonies from the Lochac College of Heralds. 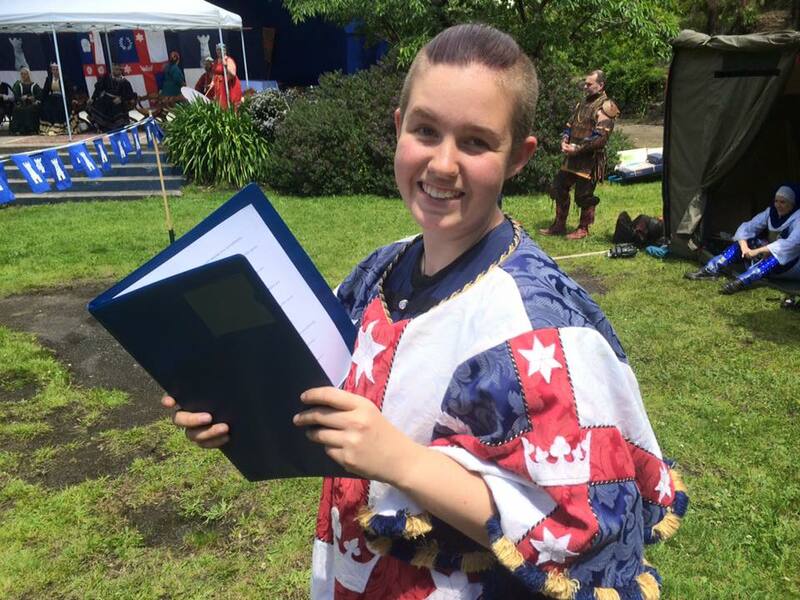 Specific to Crown Tournaments, I had to make sure I had a copy of Invocation Court (the court that precedes the beginning of Crown Tournaments), the Crown Tournament finals script, and the Induction of the Heirs (on the field) script. The book of ceremonies cover that I made from combining a period image with Lochac’s Kingdom arms. The book of ceremonies spine was covered, too. Given the relative last-minute-ness of making this book of ceremonies, I had to come up with a way of making sure the folder would not be too much of an eye-sore in the countless photos it would show up in (given that the heralds are often in many court/background shots). The solution I came up with was to find a picture of an extant, pre-17th century book cover to print out and cover the folder with. The one I settled for was English Renaissance (not much later than the period of the current Crown, the Tudor-styled Steffan and Branwen), taken from: Christopherson, Historia Ecclesiastica. Lovanii, 1569. To give it a Kingdom touch, I used the picture of the Lochac arms from the Kingdom website to cover the heraldry in the centre of the book cover I used. The covering of the book of ceremonies made it relatively inconspicuous in photos. As well as including the ceremonies, I made sure to print out lists of all of the entrants with their consorts (names and titles in order of precedence), as posted by the Crown. 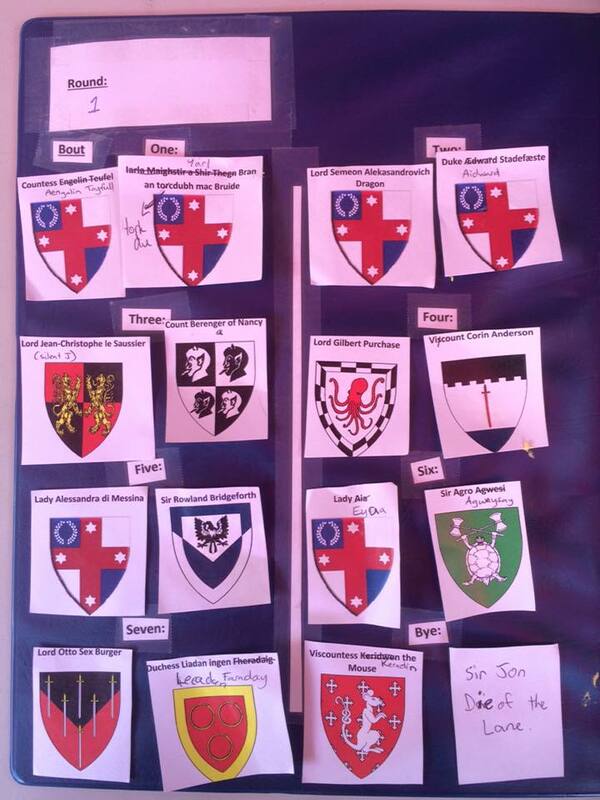 Furthermore, I went in to the Lochac Roll of Arms and found as many blazons as possible for the entrants and their consorts. (A blazon is the written, taxonomic description of a device – they’re needed for the finals ceremony for Crown Tournament as part of the heraldic announcement). In order to allow newer voice heralds to assist with announcing the bouts and rounds of the Crown Tournament, I attempted to hunt down a Lochac-specific tournament script for voice heraldry. Unable to find such a document, I decided to use my previous experience at heralding tournaments to create my own script. It includes the Crown Tournament specific conventions (e.g. full salutes for all bouts of all rounds, and the byes being fought to keep combatants warmed up). The scripts turned out to be rather useful as I ended up having five volunteers who had never heralded a Crown Tournament (and some of them hadn’t heralded any tournaments). I did get some feedback that the script was great, but that it would also be useful to have a one-pager with just the spoken words on it. In response to the feedback, and my own observations for improvement, I edited the script for next time. For anyone who wants to use this script, please do so! Crown Tournament Voice Heraldry 101 (a script for heralding Crown Tournaments in Lochac). allowed for all bouts and byes in a round to be seen at once. 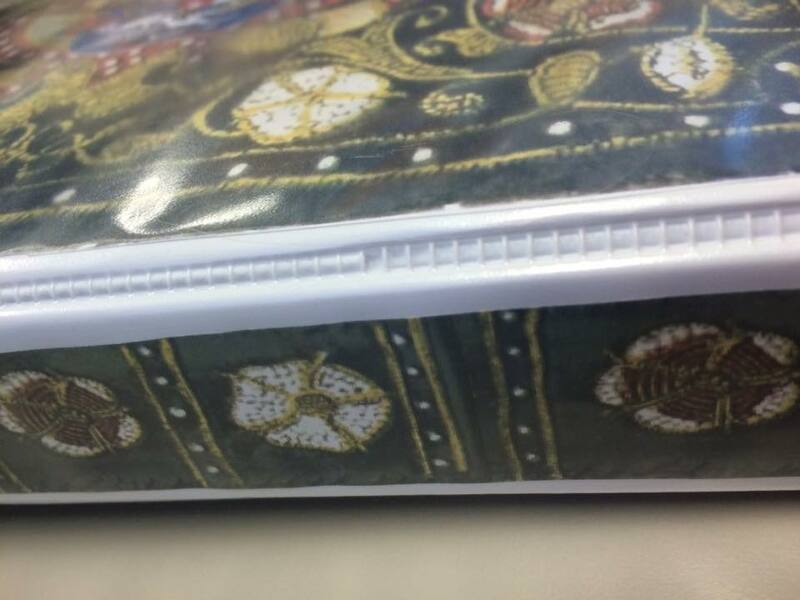 Each folder also had a pen hooked into the spine so that heralds could write notes, if needed. 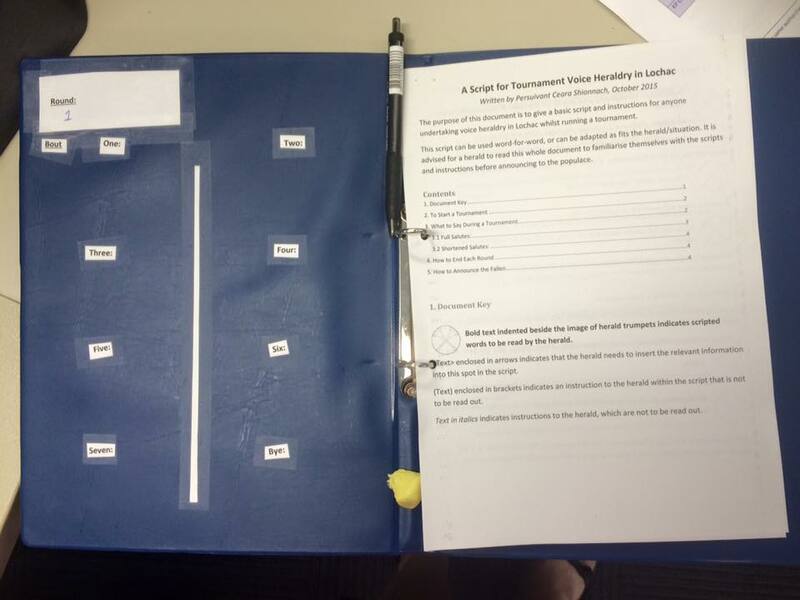 A photo of the layout of the inside of the folders I setup for the voice heralds at Crown Tourney. The voice herald scripts were on the right and the bouts were set up on the left. Lastly, I made sure that there were two folders available so that they could be rotated when need be (i.e. 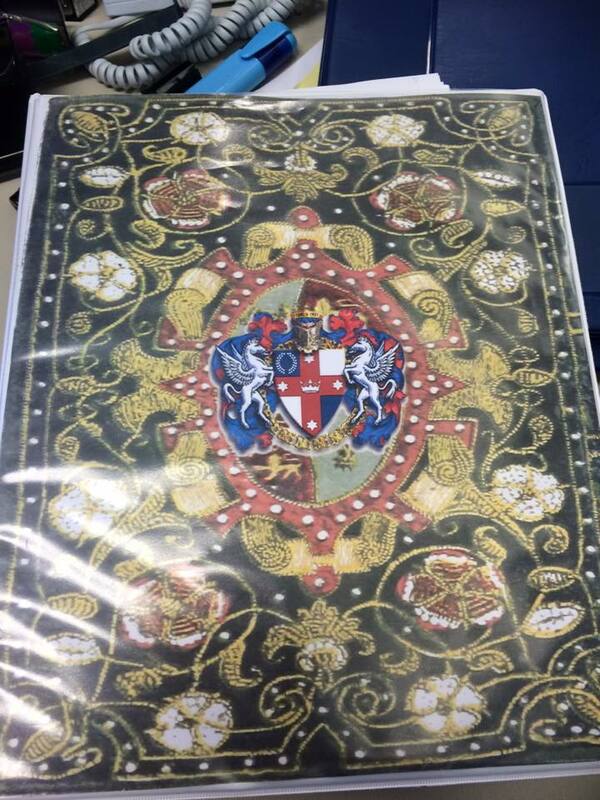 whilst one folder was in use, the next round could be set up in the second folder). Blu-tacking the names/devices for each bout made it really easy to setup, and read, each round in the herald folder. It’s worth noting, too, that I didn’t leave the volunteers to themselves with these folders. As they were less experienced with tournaments, I ensured that a more experienced herald acted as second for them. The role of the second was to whisper prompts (either actions for the herald to take, the next part of the script if they were lost, or the pronunciation of difficult names/titles). This worked really well, with the volunteers all enthusiastic about having the help to feel confident in heralding.